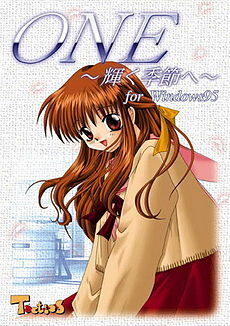 ONE ~To the Radiant Season~ (or One: ~Kagayaku Kisetsu e~) is a 1998 Visual Novel, by Tactics, a branch of the Visual Arts company Nexton. The makers of ONE ~To the Radiant Season~ would later form Key Visual Arts and make Kanon, they would however take alot of inspiration from ONE, especially character design. Take a look at the picture and then look at Ayu from Kanon. ONE tells the story of Kouhei Orihara, a Japanese high school student who suddenly finds his ordinary, everyday life pushed to the brink of collapse by the seemingly inexplorable expansion of an inner reality which threatens to replace his own. In the long and cold winter before the Radiant Season, he will encounter new friends, rediscover old promises, witness ties forged and broken, and learn of the things which everyone must leave left behind. Kouhei suspects that at some point his current life will change while living a peaceful daily routine. His parents died when he was very young, and after his younger sister dies, he begins to seclude himself in the Eternal World, a world within his mind. The game's recurring theme is a focus on the Eternal World, an alternate space that Kouhei created out of his want for a place in which nothing ever changes. He starts receding into this world about a week before disappearing, at which time every one, including the girl he loves, forget about him, at which point he falls into the Eternal World completely, making it seem as if he never existed in the real world. His only hope of returning is to form a strong bond with someone prior to leaving, and following his guide back to the real world. Anime of the Game: ONE ~True stories~ and the all-ages OVA. Can't Hold Her Liquor: Mio Passes out relatively quickly when drinking during Akane's route, justified as she is a petite and underdeveloped 10th grader. Catch Phrase: Nagamori says "You know" and "after all" alot, leading Kouhei at one point to call her Nagamori of the planet 'You know after all'. Caught the Heart on His Sleeve: Mio tends to hang on Kouhei's sleeve, becomes a small plot point later on in her route. Cerebus Retcon: Misaki decides to take her revenge on Kouhei for running into her by saying "Who are you?" when he walks up to the roof, little did she know that he was in the middle of a breakdown because he actually was being forgotten by everyone, and she was the last one that would remember him. How Kouhei first meets Nanase, not so much Meet Cute as Meet Cruel. Also happens with Nanase regularly. Also how Kouhei first meets Misaki, also an inverted Funny Aneurysm Moment when Kouhei decides to not say anything. Since Misaki is blind, she keeps calling hello and when noone answers she becomes afraid they fell unconcious. Disabled Love Interests: Misaki and Mio. Did I Just Say That Out Loud? : Kouhei speaking his mind by accident during Nanase's h-scene. Nanase: Stop it, you're embarrassing me! Deadpan Snarker: Kouhei from the being right to the end. Defrosting Ice Queen: Nanase starts this way but melts herself. Kouhei is too dense to notice. Downer Ending: If you don't end up getting one of the girls. Easy Amnesia: As you near the end of the game, everyone who once knew Kouhei slowly starts forgetting him until only the girl you chose remembers him (or alternatively, no one, if you didn't manage to get on a route) at which point he disappears. Emotionless Girl: Akane, getting a small smile out her really feels satisfying. Explicit Content: Well, it is an eroge. Expy: Inverted. Ayu, from Kanon, is an expy of Nagamori. Face Doodling: After Mio passes out from drinking too much, Shiiko draws on her face, she wakes up later on and leaves without noticing. Fan Translation: A very dedicated one, too, it has minimal spelling errors and is better than a lot of other official game translations. Featureless Protagonist: Taken a bit too literally with Kouhei. Even during scenes when he's kissing someone, he has no eyes, nose, etc. depending on the scene. After Kouhei disappears, but the game is told from the chosen girl's point of view until he comes back a year later. Akane is also waiting for her childhood friend to return. The Gadfly: Kouhei, to everyone, even to Mio. Gay Option: Subverted, though at times Hikami may seem like, he really just thinks of Kouhei as a close friend. Guide Dang It: To get on Nagamori's route you have to be a complete Jerkass to her. The Glomp: Mio does this to Kouhei quite a bit. Heavy Sleeper: Kouhei every morning in the beginning. Jerk with a Heart of Gold: Kouhei starts a jerk, finds the gold later. Mythology Gag: If you look in the shopping district in ONE, you can see a sign that says rorikon (as in lolicon). Key would go on to make Kanon, which also has a "lolicon" shop in the shopping district. Inner Monologue: Kouhei does this in the game. Laser-Guided Amnesia: Toward the end, everyone forgets only Kouhei; no other memories are lost, the ones involving Kouhei are appended to exclude him. Late for School: Kouhei and Nagamori have to sprint to class regularely to avoid being late because of Kouhei's antics when getting up. Nagamori and Kouhei running to school is also the first CG the player sees in-game. Lolicon: Technically Kouhei, in Mio's and Shiina's routes. Moment Killer: A combination of situations 3 & 4 occurs during Nanase's H-Scene, Nanase is too nervous to go through with it, so just when it seems they are about to start, She clicks on the television and blurts out "OH LOOK SUMO WRESTLING IS ON, I LOVE SUMO WRESTLING. Kouhei just sighs and tries to steer thing back on course. Akane can hold her alcohol like a pro, even though she isn't even old enough to be drinking. She goes even farther by not passing out, remaining completely level-headed, and even cleaning the entire house. New Transfer Student: Nanase turns out to be one, and Shiina also transfers schools if you take her route. Optional Sexual Encounter: Mio's h scene can be skipped for those who actively dislike Lolicon. Kouhei during Nanase's route, he can't understand why she is disappointed when he takes her to cheap Ramen restaurant to try this new ramen on Christmas eve. He does eventually get it when she runs out crying. Kouhei's aunt takes care of him even though she is rarely home. Kouhei also says he feels like a parent during Shiina's route. Patient Childhood Love Interest: Nagamori, extremely patient. Pinky Swear: Mio and Kouhei have one of these as kids. Played for Laughs: Nanase's H-scene, while being very important to the plot is Played for Laughs as opposed to drama. Sitting on the Roof: The roof is a plot-important location for a few characters, the most prominent being Misaki. Suspiciously Vague Age: Shiina never has her age stated. However, we know that she is younger than high school age. Spiritual Successor: ONE 2: Eien no Yakusoku explains more about the Eternal World but isn't made by Tactics, has different characters, setting, etc. Token Mini-Moe: Mio and Shiina. Trademark Favorite Food: Akane's waffles, Kouhei's spicy ramen, and Shiina's hamburgers. Transfer Student Uniforms: Nanase wears her old school uniform even though she got one from the school, she just likes her old one. Verbal Tic: a couple actually. Victorious Childhood Friend: If you take Nagamori's or Mio's routes. Visible Silence: Mio, all the time, justified considering she is mute. This page was last edited on 17 July 2018, at 01:52.